Fig. 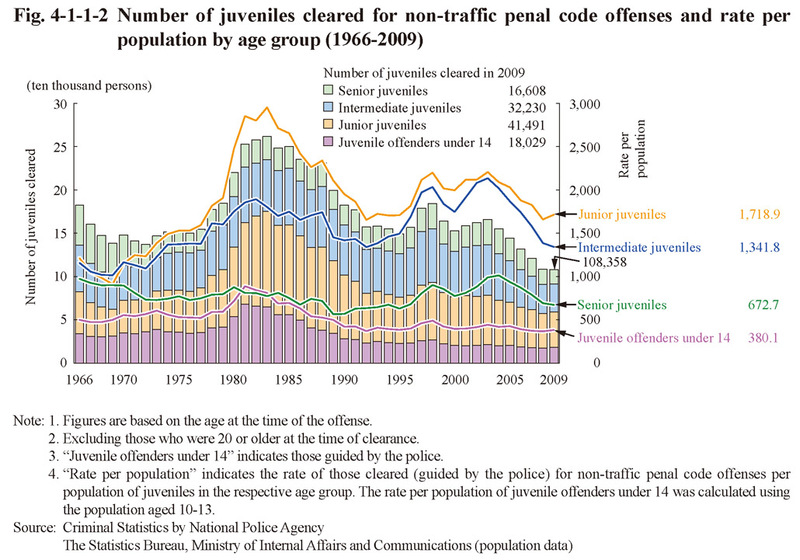 4-1-1-2 shows the number of juveniles cleared for non-traffic penal code offenses and rate per population by age group since 1966 (the rate per population of juvenile offenders under 14 was calculated using the population of those aged 10 to 13) (See Appendix 4-2). 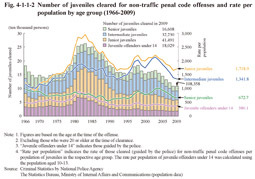 The number of juveniles cleared and rate per population were both on a decreasing/declining trend for all age groups from 2004 but increased/rose for juvenile offenders under14 and junior juveniles (aged 14 and 15) in 2009. 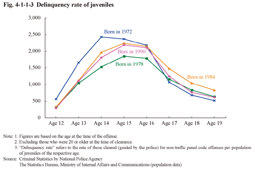 Since 2005 the proportion by age group has been the highest with junior juveniles, followed by intermediate juveniles (aged 16 and 17), with the rate per population also being the highest with junior juveniles, followed by intermediate juveniles. Fig. 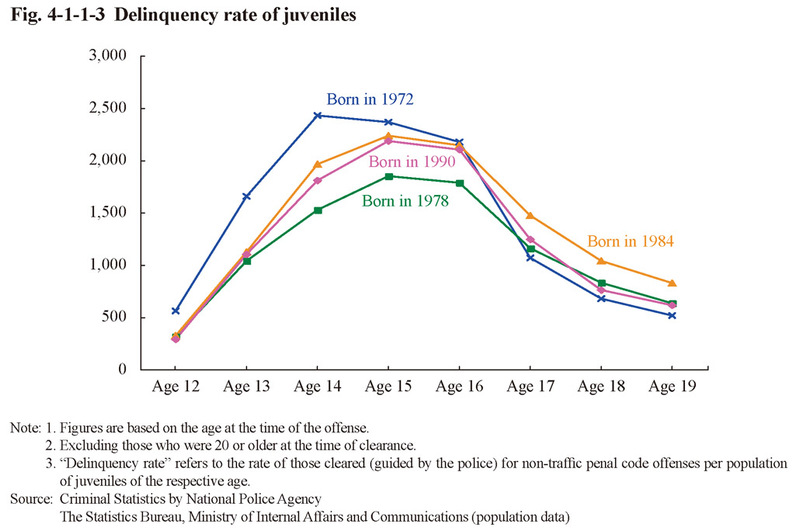 4-1-1-3 shows the delinquency rate (refers to the rate of those cleared (guided by the police) for non-traffic penal code offenses per population of juveniles) of juveniles born in 1972, 1978, 1984, and 1990 (estimated) by age group of 12 to 19, which reveals how the delinquency rate changes as the age of juveniles does. The delinquency rate peaked at the age of 14 or 15 for all juveniles and significantly declined as their age rose. By birth year the delinquency rate of those born in 1972 peaked at age 14, with the delinquency rate at a younger age being high when compared to those from other birth years. The delinquency rate at ages between 14 and 16 was remarkably low for those born in 1978 when compared to those from other birth years. The delinquency rate among those born in 1984 and in 1990 indicated similar trends but with the delinquency rate of those born in 1984 being relatively high at age 17 or older. Fig. 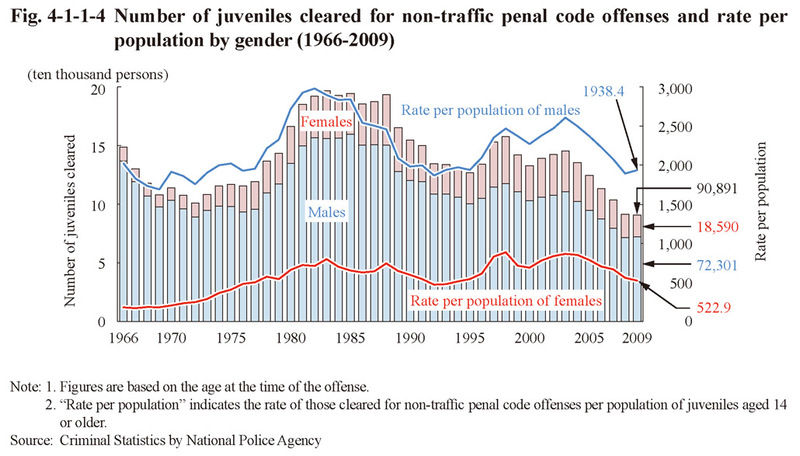 4-1-1-4 shows the number of juveniles cleared (not including juvenile offenders under 14 guided by the police) for non-traffic penal code offenses and rate per population (rate per juvenile population aged 14 or older) by gender since 1966. Fig. 4-1-1-5 shows the percent distribution of juveniles cleared (not including juvenile offenders under 14 guided by the police) for non-traffic penal code offenses (excluding dangerous driving causing death or injury in a traffic accidents) by educational/employment status. The proportion of senior high school students was the highest, followed by junior high school students, and then unemployed juveniles. There have been no significant changes in the percent distribution over recent years.